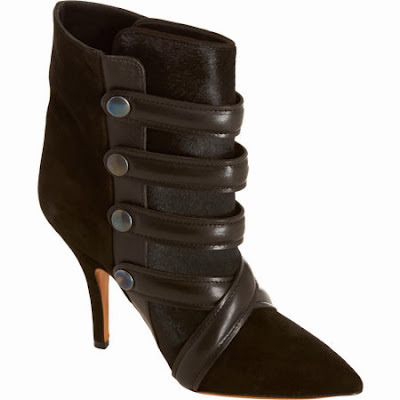 I have been obsessing over these Isabel Marant Tacy Pony Booties all fall. These not so basic black booties add a bit of edge to any outfit (which we all know I go crazy for) with their goat suede leather, the calf hair detail on the front, and the multiple leather straps. However, with the $1505.00 price tag, I can securely say they won't be joining my wardrobe this year. Fortunately, Isabel Marant's collaboration with H&M became available yesterday and the suede booties below, which I love just as much, are just a fraction of the price at $299.00. 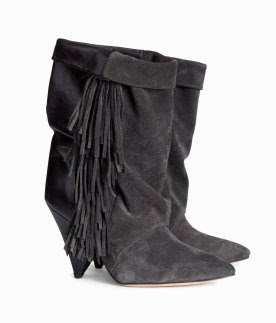 Unfortunately, by the time I was able to log onto hm.com to shop, my size was sold out :( So, I will continue my search for an edgy bootie that is similar, but in the meantime I think it's time to start a Isabel Marant savings fund!! Tell me, did you get a chance to shop the Isabel Marant pour H&M collection? If so, I'd love to hear what pieces you added to your wardrobe.